Niamh McCarthy made it a discus double for Ireland as she delivered a second silver medal of the day in the F41 final. The Cork woman emulated compatriot Orla Barry’s earlier feat as her throw of 26.67 was enough to secure her second-placed behind Tunisia’s Raoua Tlili, who smashed the world record with a gold-winning 33.38. Tlili’s countrywoman Fathia Amaimia took bronze thanks to a 26.16. 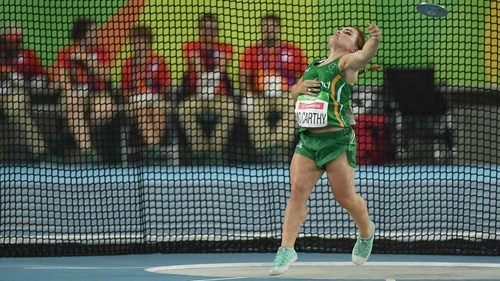 It was a remarkable performance form McCarthy, appearing at her first Paralympic Games. She had claimed bronze at the IPC Athletics World Championships in Doha last year, and set a new European record at this year’s Para-Athletics European Championship when scooping silver. But this was the cherry on the top, a sweet moment for the 23-year-old that will spark great celebrations in her home town of Carrigaline. "I'm over the moon," she told RTÉ Sport. "It's my first games and I'm coming home with exactly what I wanted. "I wanted that silver. I fought hard for it and I'm so proud that I got it. "I didn't even throw my best. I've thrown further but that's all I needed to do today. "I performed and did what I needed to do to get that medal."